In a few short months in the Shenandoah Valley, Stonewall Jackson rewrote military history. Accompanied by George Patton's great-uncle and a staff of able subordinates, the Bible-quoting general used his own unique view of past military doctrine to defeat a series of converging enemy armies. American military strategy has never been the same since. Jackson's aggressive personality enabled him to constantly maintain the initiative. While cloaking his own operations in tight security, he was often able to discern the aims of his opponent. Frequently outnumbered, he managed to keep enemy units separated, and to defeat them in detail. 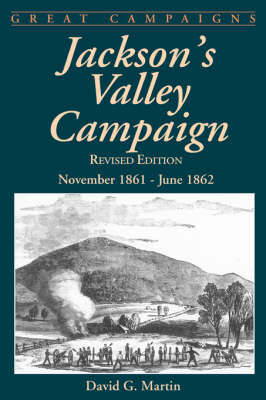 Jackson was able to co-ordinate infantry, cavalry, and artillery operations, and was particularly successful in turning the normally slow-moving infantry into an effective mobile strike force.Jackson's Valley Campaign is supplemented by sidebars on famous units, weapons, incidents, and in-depth personality profiles of Jackson and his opponents. Complete orders of battle and special maps that clearly illustrate Jackson's operational doctrine are enhanced by unique charts that show the distances and rates of march of Jackson's "foot cavalry" between all major points in the Shenandoah Valley.In the long-awaited revision of his out-of-print classic, the author describes Jackson's war of maneuver and the tactical ideas it represented, without losing sight of the individuals and units on both sides who tested military theory with their lives. John C. Fremont, "Napoleon" Banks, Turner Ashby, Belle Boyd, the Louisiana Tigers, Blenker's German Division, and the Stonewall Brigade all live again in this colourful but thoughtfully written account.